The ultimate in precision & simplicity. This heavy-duty gauge system is designed for use with a wide range of repetitive length cutting or drilling machines. 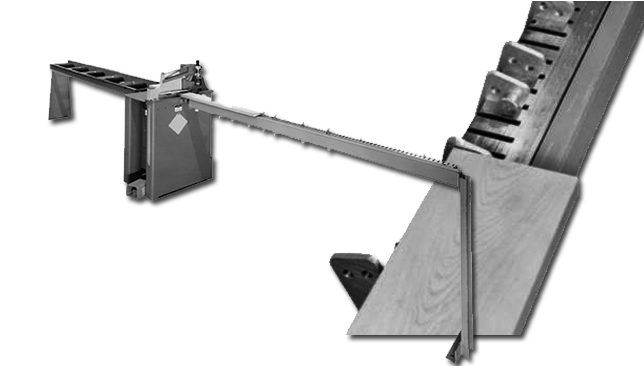 It can be fitted to any chop saw, miter saw or drill press. The fast and accurate swinging stops allow for multiple preset lengths. Stops swing into position for use and swing away when not in use. Stops can be adjusted to within 1/32″ accuracy. The all-steel gauge bar is super rigid. The gauge bar stops will not slip. You get super accuracy year after year. The absolute best gauge system made! No power required! No software to upgrade! Complete gauge bar systems are available in lengths from 8′ to 20′ in 2′ increments. System options include an infeed idle roller conveyor (8′ to 20′ in 2′ increments).